The two men accused of fatally stabbing a Little League president outside a downtown San Jose nightclub over the weekend were formally charged with his murder on Wednesday. San Jose residents Robert Ruiz, 32, and Aaron Vallejo, 24, are suspected of getting involved in an altercation with 35-year-old Frank Navarro and Navarro's co-workers at Tres Gringos Cabo Cantina early Sunday. The president of a San Jose Little League organization was fatally stabbed near a downtown nightclub early Sunday morning, marking the sixth homicide of the year in the South Bay city, according to police. Kris Sanchez reports. On Wednesday, Navarro’s family members told NBC Bay Area that he worked as a security guard at the cantina. They believe he may have been stabbed after one of the suspects showed a false ID. Since the photo didn’t match the man who presented it, Navarro apparently confiscated the ID, but that move may have cost him his life, his relatives claim. “I needed to see who took Frankie away from us,” said Navarro’s aunt, Yolanda Beltran. Navarro was the president of the Eastridge Little League and, according to social media posts, also coached baseball and football at Overfelt High School. “He would do anything for anybody, he was just an honorable man,” said Navarro’s friend, Vincent Brunelli. 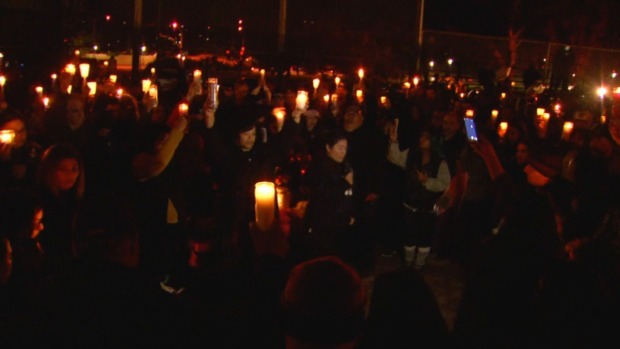 More than 300 mourners held a candlelight vigil on a baseball field Sunday evening for Navarro, who was remembered as a mentor to many young people in the community. "He touched a lot of lives, he mentored kids, he'd always try to help," said Phillip Beltran, Navarro's uncle. The stabbing was "just senseless," he added. Both Ruiz and Vallejo were booked into the county jail on suspicion of homicide. They both appeared in court on Wednesday and were charged with homicide. The suspects did not enter pleas. One of them has a prior strike for a robbery conviction, while the other faces an additional charge of wreckless driving, while evading a police officer.